Cyclists pose before the Sitka Community Bike Ride on Saturday, May 28, 2016, through downtown Sitka. The Petro Marine Dock is where the steamer The Mexico would have docked 125 years earlier with the first bike seen in Sitka. Sitka cyclists were in the mood to celebrate on Saturday, May 28, and they had two reasons for celebration during the Sitka Community Bike Ride held through downtown. On May 28, 1891, the first bicycle was seen in Sitka (link goes to a Sitka History Minute episode), when a man (C.H. Calhoun of Washington, D.C.) arriving on the Pacific Coast Steamship Co.’s steamer The Mexico brought one to town. Saturday was the 125th anniversary of the bike’s arrival in Sitka. The other reason to celebrate was the announcement a week earlier that Sitka had been upgraded to a Silver level Bicycle Friendly Community award level, after earning Bronze in 2008 and 2012. 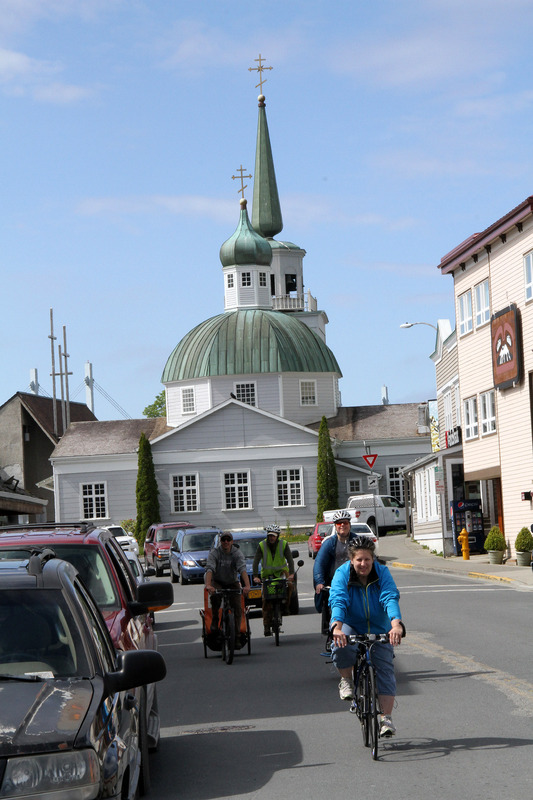 Sitka was Alaska’s first community to earn a Bicycle Friendly Community designation. 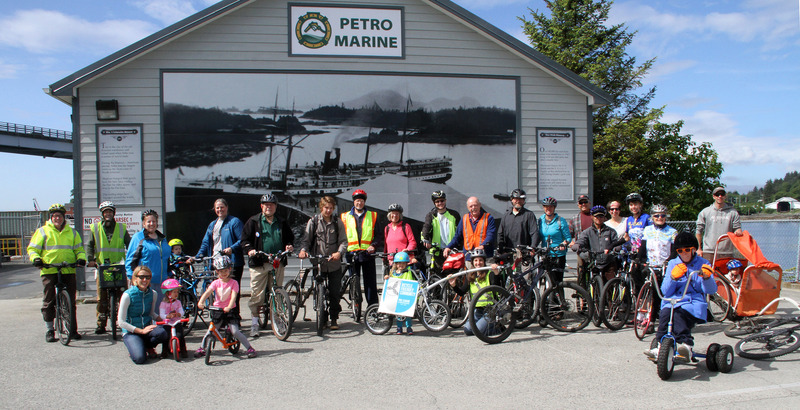 Here is a slideshow of photos from Saturday’s Sitka Community Bike Ride. Sitka is moving up. 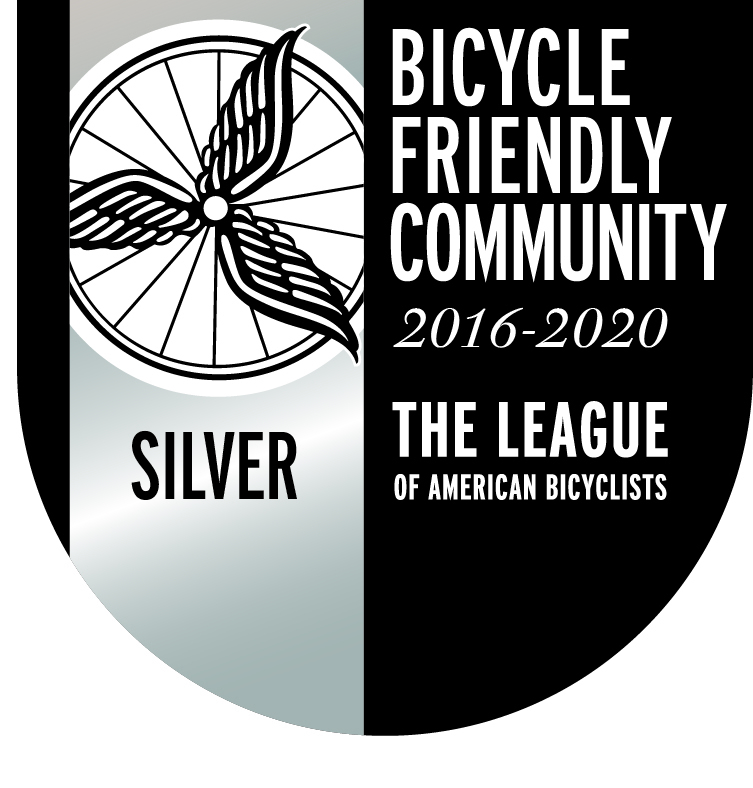 After winning two Bronze-level designations in the Bicycle Friendly Community (BFC) program in 2008 and 2012, the League of American Bicyclists (LAB) announced on Wednesday, May 18, that Sitka is now at the Silver level for the next four years. With the announcement of 34 new and renewing BFCs Wednesday, Sitka is one of 372 communities in all 50 states to hold a Bicycle Friendly Community designation. Of those 372 communities, there are zero at the Diamond level (the highest), five at the Platinum level, 25 at the Gold level, 73 at the Silver level, and 269 at the Bronze level. 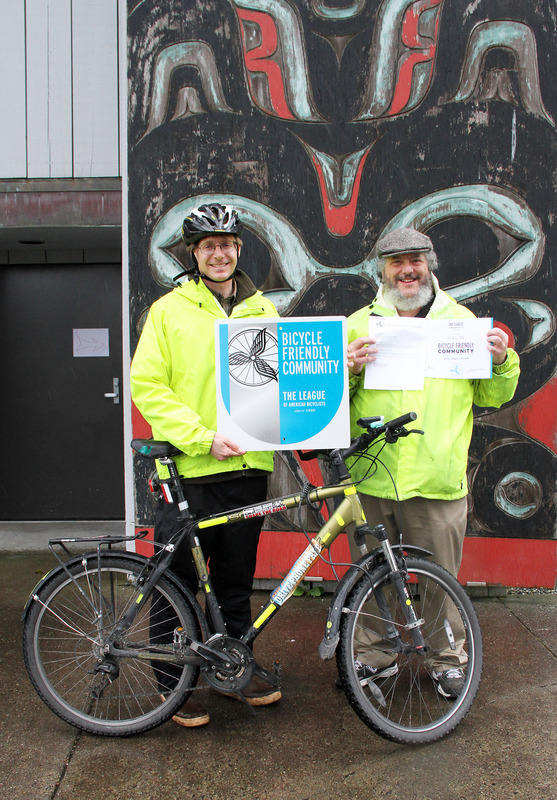 Sitka was Alaska’s first Bicycle Friendly Community in 2008, and the first to repeat in 2012. Since then, Anchorage (Bronze level 2009, Silver 2013) and Juneau (Bronze level 20011, Bronze level 2015) have joined the ranks of Bicycle Friendly Communities. According to the League of American Bicyclists, the BFC award recognizes Sitka’s commitment to improving conditions for bicycling through investment in bicycling promotion, education programs, infrastructure and pro-bicycling policies. Becoming a Bicycle Friendly Community was one of the community wellness initiatives from the first Sitka Health Summit in October 2007. At the summit, Sitkans said they wanted to become friendlier to bikers and walkers in town, and residents started gathering information for our first application in 2008. A few years later, a Walk Friendly Communities program (modeled after the BFC program) was initiated and in 2013 Sitka became the first Alaska community to win a Bronze level award. Juneau has an honorable mention WFC designation. When Sitka first applied for a BFC designation in 2008, it led the state (for communities larger than 600 people) with 2.87 percent commuting to work by bike, according to the American Community Survey compiled by the U.S. Census Bureau. By the time Sitka sent in its second renewal application in February 2016, Sitka had nearly doubled its bike commuting percentage to 5.42 percent. That’s nearly 10 times the percentage of bike commuters nationwide (0.6 percent), and five times the Alaska average of 1.1 percent. 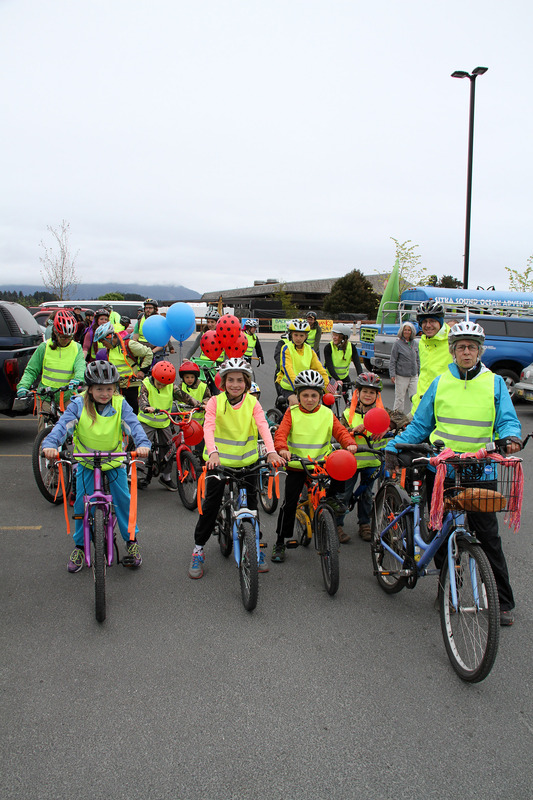 Cyclists pose for a group photo after Sitka’s first family friendly Kidical Mass ride in August 2015. “Your application really painted a great picture of the improvements made in Sitka since its last application,” said Ken McLeod, State and Local Policy Manager for LAB. “Sitka was on the border of earning a Silver in its Spring 2012 application due to the high percentage of people biking to work, strong youth education programs, and a diversity of initiatives that pointed toward a shared community investment in creating a great place to ride a bike. 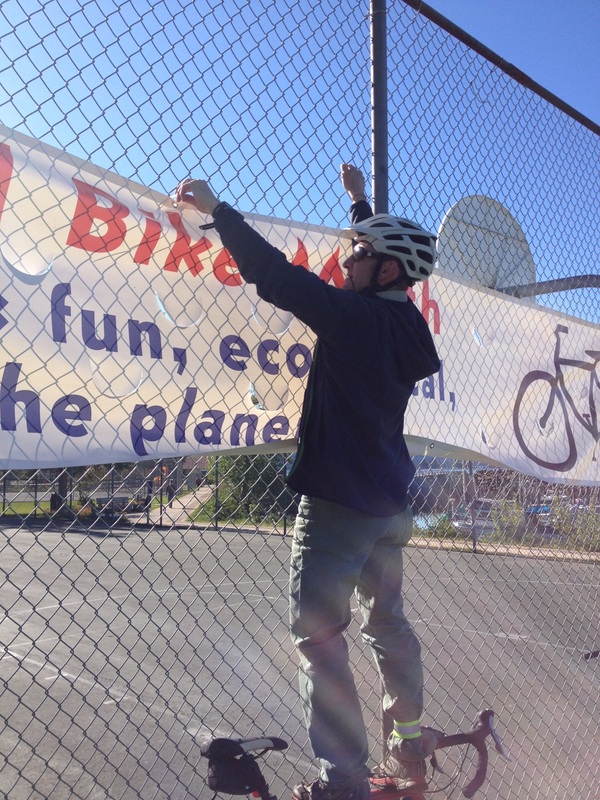 Bike mechanic Bill The Giant works on a bike before the Sitka Community Bike Ride and Picnic in May 2015. Sitka has a unique bicycle culture compared to many noted bike communities. While Sitka has had a few cyclists do well in state and national races, there isn’t much of a racing community in Sitka like there is in other cities. 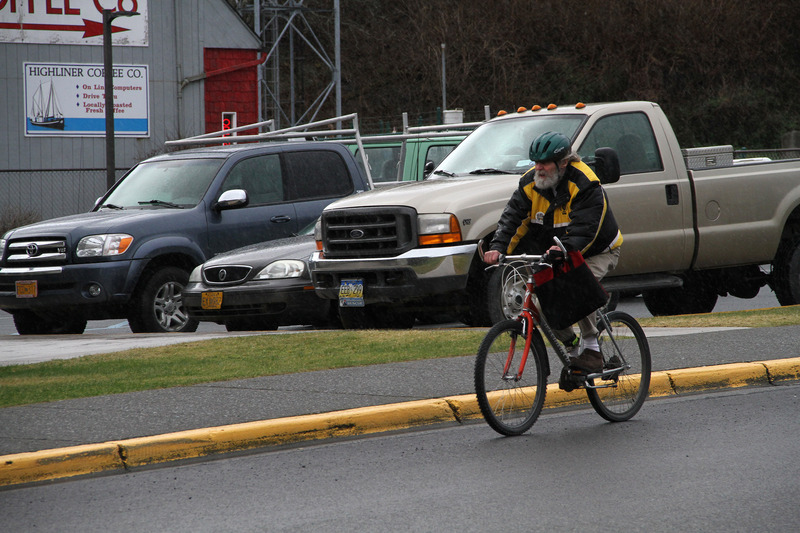 You rarely see the Spandex-clad bicycle racers in Sitka. Instead, most Sitka cyclists are biking to work or school, to run errands or just to have fun, frequently wearing rain gear or using studded tires in the winter. In recent years Sitka has hosted bike safety camps for youth riders, held a campaign to get bicyclists and walkers to be more visible when they ride (note all the traffic yellow jackets or reflective tape people now wear), and increased the number of cycling events such as hosting the Sitka Community Bike Ride in May, a Kidical Mass family friendly ride in August, and on the International Winter Bike To Work/School Day in February. Sitka cyclist Stan Schoening rides his bike to KCAW for his radio show on International Bike To Work Day in February 2016. This week (May 16-20) is National Bike To Work Week, and Friday, May 20, is National Bike To Work Day. Sitka cyclists who commute to work or school can enter for a chance to win a $100 gift certificate from the Yellow Jersey Cycle Shop or a $50 massage from Oceanside Physical Therapy by filling out tickets each time they ride at Yellow Jersey. The winning tickets will be drawn at the Julie Hughes Triathlon on Saturday, May 21, at Blatchley Middle School. On National Bike To Work Day on Friday, cyclists who show their bike helmets between 11 a.m. and 2 p.m. will receive a 15-percent discount on lunch at the Larkspur Café. 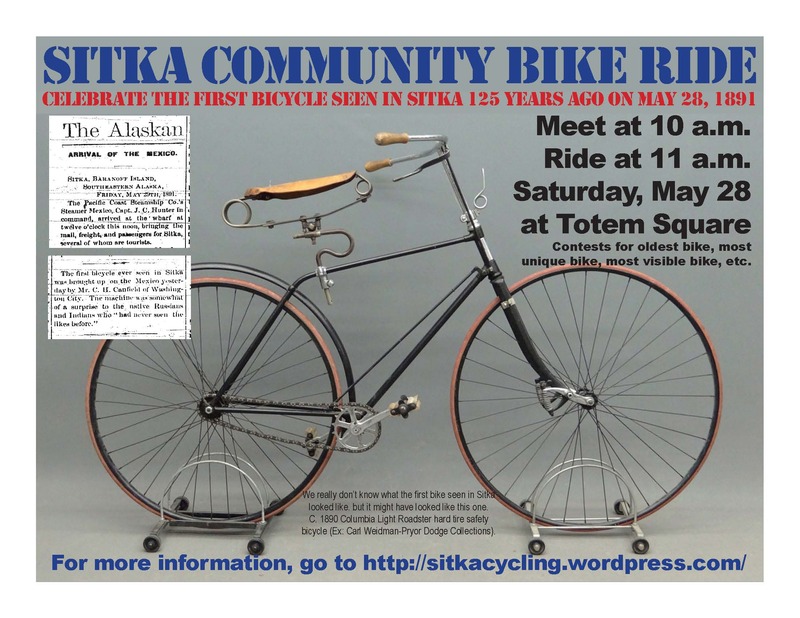 The Sitka Bicycle Friendly Community Coalition will meet at noon on Friday at the Larkspur to finalize plans for the Sitka Community Bike Ride on Saturday, May 28, when we will celebrate the 125th anniversary of the first bike seen in Sitka (on May 28, 1891). 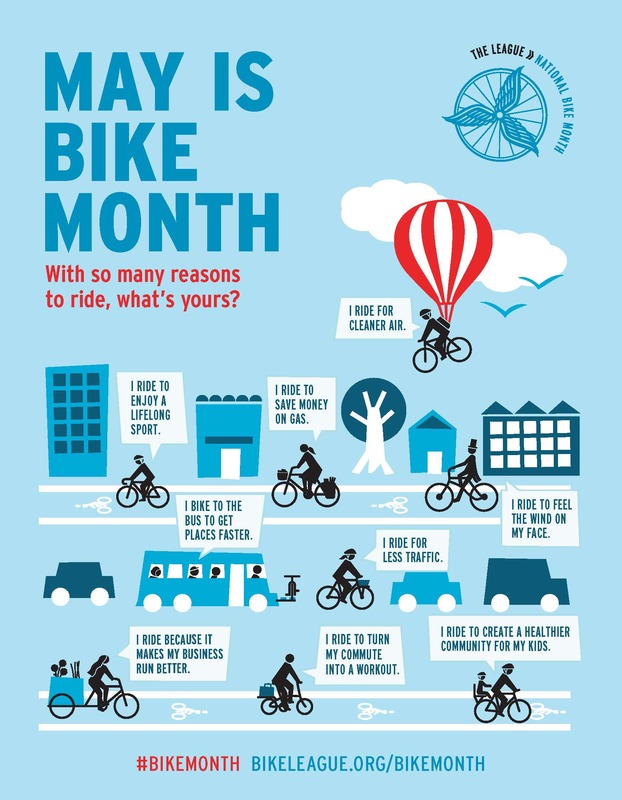 People should meet at 10 a.m. on May 28 for bike checks and maintenance, helmet fittings and a variety of contests such as oldest bike, most unique bike or most visible bike. At 11 a.m. on May 28 we will have a group ride through downtown Sitka. For more information about the Sitka Bicycle Friendly Community Coalition and the Bicycle Friendly Community award, go to https://sitkacycling.wordpress.com/, or contact Doug Osborne at 747-0373 or Charles Bingham at 623-7660.